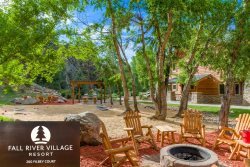 Choose Fall River Village as your headquarters for your adventures and your Rocky Mountain National Park activities. Depending on the time of year, you can back country ski, snow shoe, fly fish, hike, rock climb and more. Then, come back to your cozy, modern two bedroom, two bathroom condo, flip on the switch of your gas fireplace, and cozy up with a movie on Netflix or Amazon. Or make a fire in a nearby fire pit and roast s'mores. Sick of the I-70 tourist trap and crowds of the ski resorts? Explore the pristine winter conditions of Rocky Mountain National Park on this custom guided adventure. This package features two days of custom guided backcountry skiing with a Colorado Mountain School guide in Rocky Mountain National Park, plus two nights lodging at Fall River Village resort condos for up to four skiiers or boarders. Book an AIARE Avalanche Course with Colorado Mountain School and Stay at Fall River Village for $120 per night plus tax all winter-long! Check out their course availability and schedule online. Discover the serene beauty of the mountains in wintertime on this four-hour snowshoe hike. Snowshoeing is one of our favorite Rocky Mountain National Park activities. What better way to explore! Guests will be picked up from Fall River Village. An educational driving tour along the Peak to Peak highway will be enjoyed to the Wild Basin trail head. Then, guests embark on a snowshoe adventure, learning about the properties of snow and its inhabitants. Call Fall River Village at 970-325-6864 to make your Snowshoe & Stay reservations! From wild Brown Trout in Boulder Creek to gorgeous Cutthroat Trout in the high mountain lakes and streams of Rocky Mountain National Park, Front Range Anglers` goal is to give you lasting memories of a true rocky mountain fly fishing experience. Front Range Anglers is committed to providing you with the best Colorado fly fishing guides and guided fly fishing experience possible. They specialize in fly fishing trips into Rocky Mountain National Park, where anglers can catch the beautiful greenback cutthroat trout. Front Range Anglers` guides are properly permitted, CPR certified and fully insured. Our professional guides are on the water every week guiding and teaching fellow anglers. The premier attraction of Rocky Mountain National Park is the scenic and breathtaking byway named Trail Ridge Road. As the nation`s highest continuous paved highway, this road meanders through various life zones on its way through the park and over one of the largest, most pristine stretches of alpine tundra in the lower 48 states. A professional educational guide will provide participants with a unique overview of the park`s history, flora, fauna, and geology while they view passing landscapes from the comfort of a 14-passenger bus or 12-passenger van, with opportunity for taking pictures at the many pull-off stops along the way. Some of the more notable features that guests will visit are the Alluvial Fan, Rainbow Curve, Milner Pass (Continental Divide), and the Alpine Visitor Center. Both lunch and admission into Rocky Mountain National Park are included in the registration fee.